I was quite surprised when the first comment on yesterday’s post about my latest cross stitch project included the line ‘Eee, I see a trilobite outline’. Indeed you do, Carla, and I am impressed with your powers of recognition! You really should play me on Draw Something as my artistic skills on that really do take a bit of deft identifying. 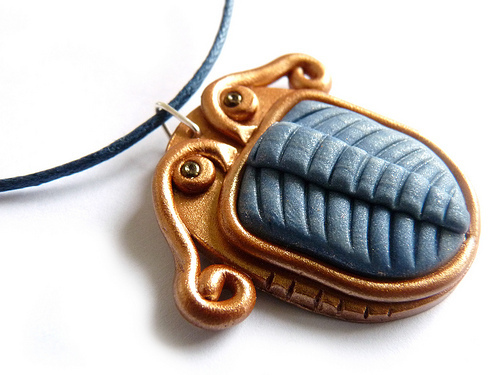 As I was thinking of trilobites yesterday (as you do) I decided to try and make myself a trilobite inspired pendant necklace, similar to those I have seen sold in a few of the tourist shops on the south coast, in fossil rich areas. 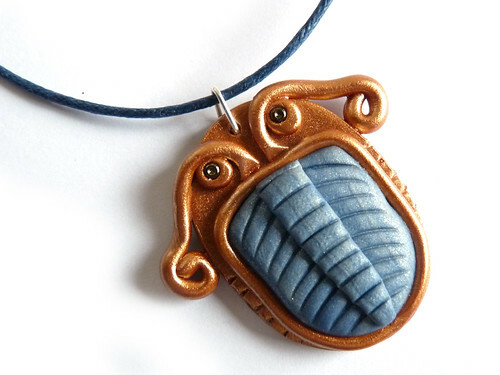 These stores sometimes carry quite nice pendants of real trilobite fossils set into metal surrounds. I have no real trilobite fossil, so I thought I would make my own. 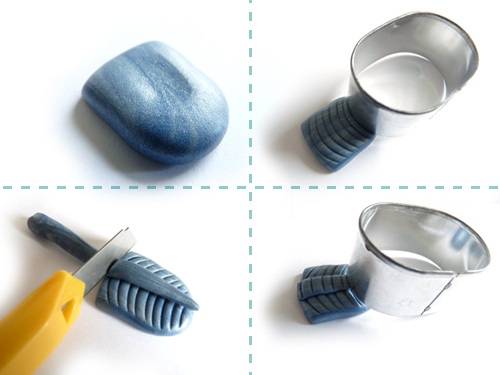 All you need to play along is some polymer clay, a round cookie cutter or bottle lid (something to make a slightly curved indent) and something to poke a hole in the finished piece, like a tapestry needle or cocktail stick. 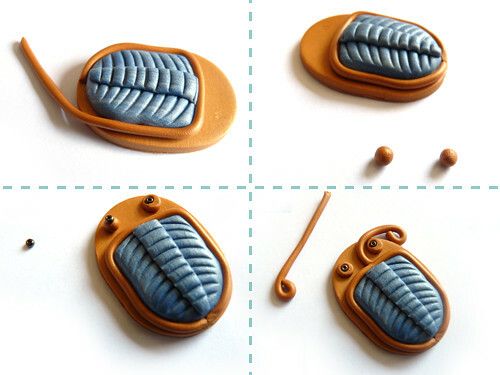 I have used three small pieces of polymer clay for my pendant, but you could use a single colour. 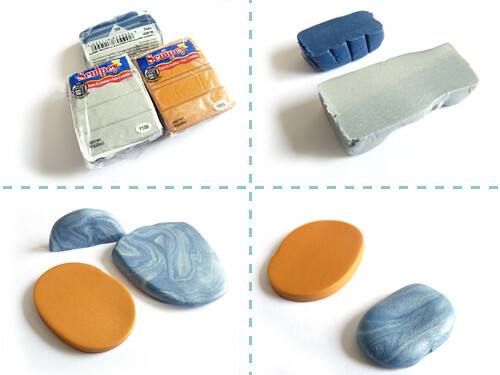 The colours I have used are Sculpey silver 1130, Sculpey gold 1088 and Fimo sapphire blue 8020. There is no particular rhyme or reason to these colours other than they are the colours I am using for my cross stitch piece and I like to dress like my wall art. I mixed the blue and silver clays together to give me a colour close to that of the embroidery floss I was using for the cross stitch. I had intended to blend them completely, but part way through I got distracted and when returning to the table decided I quite likes the marbled effect so left it at that stage. Obviously just do what you think looks nicest. Take a small rolling pin or similar smooth cylindrical object (such as a glass jar) and roll some clay to about 2.5mm thick. Using an oval cutter or a knife, cut an oval about 4cm long, and lay to one side. Taking another piece of clay, form a slightly smaller oval with your hands, giving it a slightly ‘domed’ appearance. 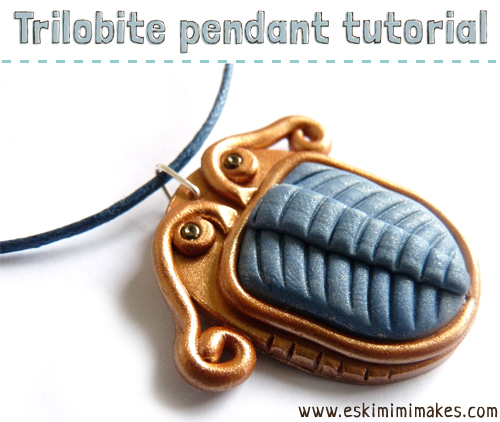 You should now have the two basic pieces of your pendant. Using a knife, cut the top off of your domed oval. Use a round/oval cookie cutter or anything else with a curved edge (such as a bottle top) to make curved indentations down the length of the domed piece. Roll a small ‘snake’ of clay, tapering at one end, and lay the thinnest edge at the rounded bottom edge of your domed piece, down the centre. Trim the top piece off so it is the same length as the domed piece, then press along the length, to flatten it slightly. Use the same cookie cutter (or alternative) as you used before to make another row of curved indentations, this time down the length of the thinner centre piece. They should roughly match the indentations on the domed piece below, but this need not be perfect (fossils are rarely, if ever, perfect). You should now have something that looks like this. It’s looking good but needs a bit of detail. Roll a long, thin snake of clay and lay it around the outside edge of your domed centre piece, trimming the ends to fit. Roll two very small balls of clay. Lay these towards the outside edge of the flat piece of clay as eyes. You can now either take small pieces of clay or (optional) seed beads to form the centres of the eyes. Lay these eye centres on top of the balls of clay and flatten slightly with your finger to attach them to the clay and shape them at the same time. 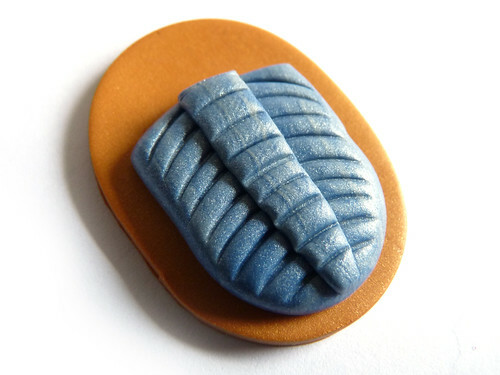 Roll two more snake of clay and curl the ends back on themselves, laying them between the eyes of your trilobite and alongside the edge of the head. Your basic trilobite is finished. Give him a smile and use this opportunity to smooth away any fingerprints if you wish. 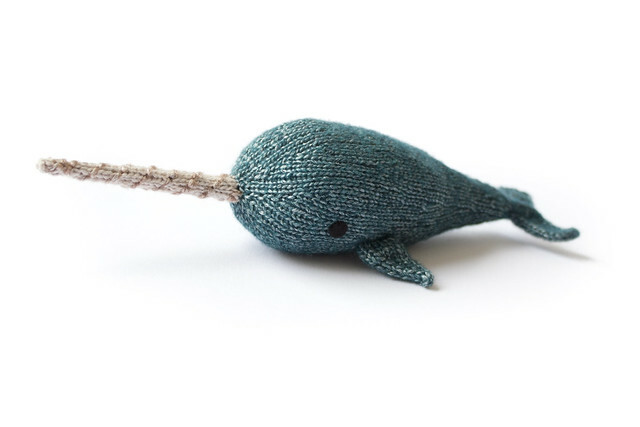 Next, use a tapestry needle or similarly pokey thing to make a hole towards the top of the pendant, between the eyes. Don’t place it less than 2mm away from the edge, so the pendant hanging stays nice and strong. 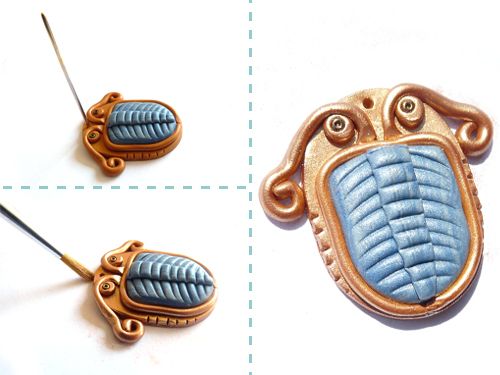 You can now, if you want a particularly sparkly trilobite, apply any mica powders or age the pendant using some ground up artists pastels. I have used a bit of bronze mica, just because I saw it in the box as I was tidying away. Opportunity knocked and I answered. If you have put any mica powder on your piece, now is a good opportunity to put it on the windowsill and see how lovely and sparkly it is. Ooh, shiny. Now, bake that piece! Fossils take many millions of years to form, but yours should be done in around 25 minutes at 130ºc (or 275ºf for those of you who are metrically challenged). Make a sandwich and a cup of tea. When the trilobite has finished its trip to the oven, let it cool completely, and then decide if he wants a coat of varnish. I have varnished the gold areas of mine, because I decided that things can never be too shiny, and also it would stop the mica from rubbing off at all. I left the centre marbled area for a bit of contrast. You can then either thread some cord through the hole, or attach a jewellery finding such as a jump ring before stringing the pendant on a chain, cord or piece of ribbon. Now put on your new necklace and stand next to your trilobite cross stitch and blend into the background in an exercise of super geeky urban camouflage. WIP: Well Heeled And New Materials. That is absolutely ace! Love it! Wow – that is amazing work. Oh that looks FANTASTIC!! 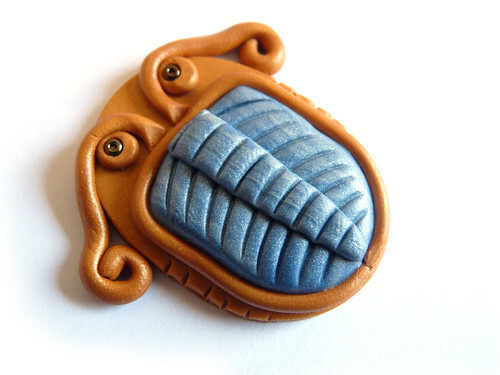 I think I found my excuse to buy more clay, and make a million trilobite pendants. You are so so talented! This is great! Oh, very cool! I haven’t messed about with polymer clay since my kids where little and we made xmas tree decorations which are still going good 15 years later. Must go shopping this week and buy some to try this with.